Warp Sett Tapes, an innovative idea that came from Master weaver Pat Taylor, can be stuck on the top and bottom of your weaving frame. 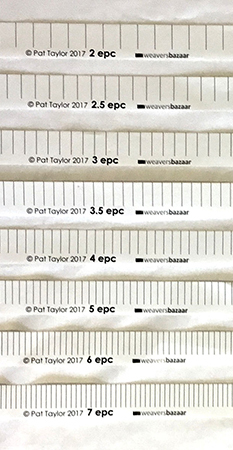 Each pack contains 2 tapes of each of the setts: 2 epc (5 epi), 2.5 epc (6 epi), 3 epc (7.5 epi), 3.5 epc (8.8 epi), 4 epc (10 epi) , 5 epc (12.7 epi), 6 epc (15.2 epi) and 7 epc (17.8 epi). Sixteen tapes in all.